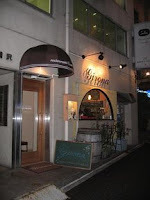 I love Spanish food and this is the only place I have been to (so far) in Tokyo that has traditional Spanish Tapas. The restaurant is small and provides both table and bar seating. I love sitting at the bar because it is covered with Spanish olive oils and nick nacks. You can also see straight into the kitchen. We always order the Gambas Ajillo (pronounced Ahillo) which is prawns cooked in olive oil, garlic and chili. The Wagyu Harami, although not Spanish, is perfectly tender and a delight to the taste buds. Expect it to come out very rare. Almost everything we eat here is excellent except the bacon steak was a disappointment and the Paella is average. Best Dish - Gambas Ajillo. Cost - 8,000 yen for 2 including 2 glasses of wine. Seats - 18 table seats and 8 at the bar. Wine list - A good variety of Spanish wines all priced well, 2 reds and 2 whites by the glass.